Every one in four eCommerce customers abandon their cart due to complicated website navigation. 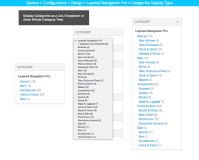 Provide fast, convenient and super-visual browsing experience with Layered Navigation Pro extension for Magento. 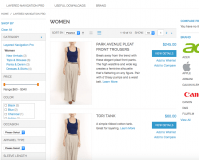 Every one in four eCommerce customers abandon their cart due to complicated website navigation. Provide fast and convenient browsing experience with Layered Navigation Pro extension for Magento. 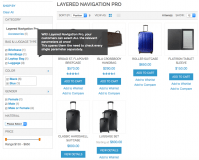 Why Use Magento Layered Navigation Pro? In a large store, help shoppers find the right item fast. Let customers tick all necessary checkboxes at once. Avoid annoying page refreshes (with Ajax-powered requests). The Magento 2.x.x version is coming soon! 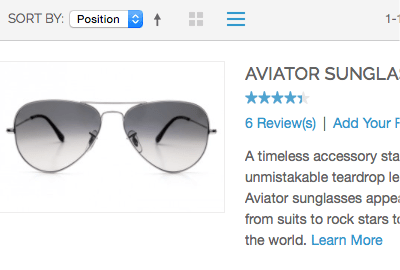 Navigation either makes it or breaks it when it comes to user experience with an online store. A poor and tricky navigation will cause visitors leave a website even before they get to know the product assortment. With the extension in place, your customers will enjoy a seamless and fast browsing experience, which will make them want to stay on your website longer and find what they are looking for. The extension allows to significantly improve the conventional search functionality. Layered navigation provides for a convenient search across multiple categories and attributes, featuring such capabilities as grid or list search results view, checkboxes and sliders, endless scrolling and others. All this together will help your customers find the necessary items and add them to cart in no time. 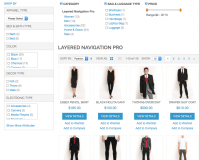 Add layered navigation to categories or homepage of your Magento store. 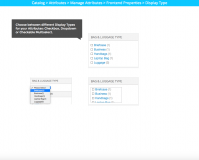 Let shoppers select multiple attributes & multiple attribute values at once. New! Use images instead of text for more visual browsing. Show search results as a grid or a list. Show the price as a slider, a range or an input field. Enable breadcrumbs to help users return to a category. Load more results as the shopper scrolls down (the Endless Page concept). Display attributes as a dropdown or a multi-select. Limit the number of attributes displayed. Automatically order attributes by alphabet or popularity. Mark selected attributes bold for users’ convenience. New! 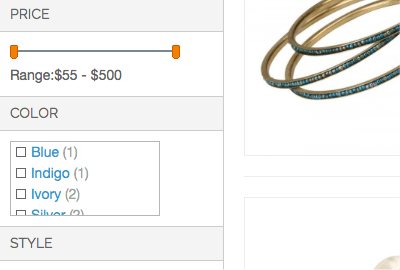 Add attribute visualization to product/catalog pages. New! Use Color Swatch even in Magento 1.4.2.x or higher! 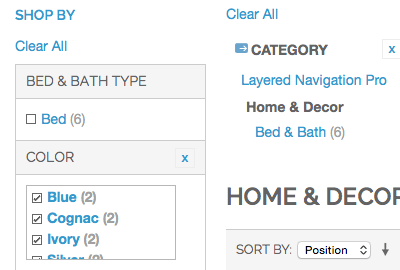 Add rel=next, rel=prev to category pages. Ultra-fast Ajax paging and sorting. Starting from version 2.7.0, Layered Navigation Pro includes the functionality of Visualize Your Attributes - Color Swatch module for Magento in its entirety. For information on how to activate and use visualization options in Layered Navigation Pro, please see the respective module's page. Magento Shop by Manufacturer extension - Allow customers to find their favourite brands instantly. * Fixed a compatibility issue with default design theme. * Fixed an issue with filtered results reset when product is removed from a compare list. * Fixed the compatibility issue with Aitoc "Shop by Brand” extension. 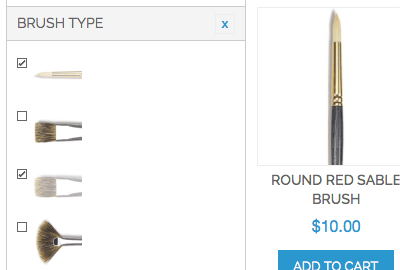 * Fixed the issue with results reset when adding a product to cart. * MySQL query optimization to improve extension performance. * Fixed an issue with the static block isn't updated when changing category. + AITOC Visualize Your Attributes - Color Swatch functionality is added into Layered Navigation Pro extension. * Fixed the issues with paging. + Added functionality to exclude attribute for a specific category. * Fixed the issue with missing pager on Magento 1.9. 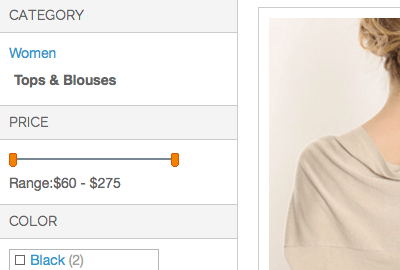 * Decimal price values are added for the price slider. 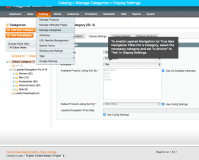 * Fixed endless page arrow (header) issue (Magento CE 1.9). * Fixed the incorrect categories order in Layered Navigation. * Fixed the issue with "1 column" page layout. * Display category block. Fix. * Shop by Brands compatibility fix. + When "Reload page while Click on Another Category" is set to "Yes", the extension now updates breadcrumbs for subcategories and categories. * The filter ranging with slider works correctly for all attributes. * A minor price-related bug has been fixed. + The extension is now compatible with Magento 1.7.0.2. * A minor search error is now fixed. + The extension is now fully compatible with Magento 1.7.0.1. + The extension is now improved in terms of SEO. * The bug with the incorrect quantities of the filtered products is now fixed. * The incorrect links are now corrected for the toolbar block. * The Endless Page feature and Shop By Brands extension are now fully compatible for Magento 1.4.0.1 - 1.4.1.1. * Price Input and Price Slider now work correctly for decimals. 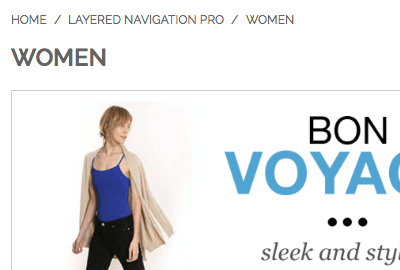 * "Go Back" button now works correctly when Shop By Brands and Layered Navigation Pro are both installed. * Shop By Brands compatibility issues are now fixed. +The extension is now compatible with AITOC's Shopping Assistant extension. * The compatibility bug with Shop By Brands is now fixed. + The bug with incorrect display of some descriptions is fixed. * The bug with multiple tabs mixing up filter results is now fixed. + The extension is now compatible with Magento 1.6.2.0. + The extension is now compatible with Shop By Brands ver. 3.0.0. * Minor search issues are now fixed. * The extension now works correctly on pages of manufacturers. * When 'Featured Attributes Limit' = 0 and 'Automatic ranging for Attributes' = Yes, automatic ranging now works. * "Clear All" and "Remove This Item" now work for categories. * The price slider tax bug is fixed. + "scroll to the top when clicking on a new parameter" option is added. * A bug with the subcategory name not changing after browsing back is fixed. * A minor compatibility fix. * The bug with the big number of attributes and categories loading slowly is now fixed. The extension is compatible with Magento 1.6.0.0. The extension is compatible with Magento 1.5.1.0. The extension is compatible with Magento 1.5.0.1. AND/OR logic for filtering feature. + “Clear” filter links replaced with images in new version to remove duplicate “Clear” links. Excellent solution, especially liked the function of displaying an image instead of text in the navigation. There was a question about the extension - they quickly answered. Definitely I will use this extension in other stores. Support of this company is excellent! Thank you for your help! Makes the layered navigation much more usable and clear. Ajax based multiple choice is supported which is a must have for a modern shop system. We had some troubles whilst another extension was installed, but the support team fixed this really quick and professionel. We are using CE 1.9. Great extension, works like a charm. Lots of ways to configure. No bugs encountered. At the beginning, I needed some help from customer service and help was delivered fast and my problem was solved in 24h. Great great support! This extension makes the default layered navigation so much more quick and useful. Works with 1.9.1 RWD theme. Installation was simple, but required quite some steps. Support is nice as well. I switched to this module from manadev extension because of conflicts with other modules installed on my site. The first thing I noticed is their professional support. I had not explained my questions twice as I had to do with previous developer. All my emails were answered quickly and carefully. The extension itself works as expected. I was recommended to use their true ajax filter module and now my navigation is loaded within milliseconds!!!!! Amazing! Thumb up, guys! highly recommend this developer. This is my 3rd extension from aitoc.Maybe They extension work great for me. layered nav module made my navigation fast and user-friendly. Support helped me within 5 hours!!! I used 3 different extensions for layered navigation before purchasing this but this one suits me better. Thank you guys. Hi, The support team is quick in their response and very helpful. If you have a magento store right now, you need to add this product to your site it will give the user a great experience on your site. Plus it helps them navigate through your site. So don't wait to add this great function to your site. I installed this extension on my most recent Magento store and it has been very useful. Allowing the customer to use multiple filters without page reload has been key to my store and increased conversion rates. The only thing I've noticed is that when using the "endless page" feature sometimes the same product will show up more than once. Not a big deal for my store, I just thought it was a little odd. Still recommend though! Works perfectly! Support is excellent from Aitoc. I wouldn't hesitate to recommend this extension. Don't be put off by 1 or 2 negative reviews, just look at how many times it's been downloaded! Spent hours looking for the ultimate layered navigation that does everything and this is it. Awesome extension and i feel it's very well priced. Support is first class and are happy to help. Take a look at all the extensions Aitoc offer as i found some extra extensions that are awesome. This guys are amazing. Great modules and 1 of the best support I have received. This module works a treat. highly recommended. 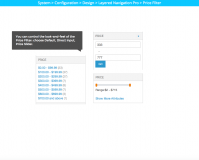 Easy to install modules plus an extremely responsive support team. Great jobs guys! The AITOC team has not only put together the best in class solutions to many of Magento's shortcomings, they also stand behind their solutions. Any question or issue that arises they are right there to help and explain. Fast, efficent and thorough. I honestly can say I cannot think of a finer support group than AITOC. Having used this for several months, we are very pleased with performance and usability. We had some problems moving to new hosting provider and staging environment but the AITOC team were quick to provide support and resolve our issues. Great extension and great support always from AITOC. Great extension to enhance navigation and Aitoc support team is fantastic with questions and help with the modules. This extension is based on the standard Magento Layered Navigation but on steriods! It's fast, it's intuitive and it creates a superb customer experience. I was able to funnel some suggestions to the AITOC team and they implemented them to make this even better. No store should be without this extension. I purchase this module and installed it on my own and ran into some issues with it conflicting with a previously installed extension (from another company). I tried to get it to work on my own with no luck. I then purchased the module installation and the staff at AITOC logged on, spent some time analyzing things and within the hour it was working properly! Great great support! This is the 2nd extension I have purchased from them with at least few more still left to purchase... The extension itself is absolutely terrific. Very professional. just excellent extension, works how promised, no bugs encountered... Would like to have more documentation on css customization - kind of hard to figure out which divs are pulled to make the look of the navigation. Will have to ask for support.